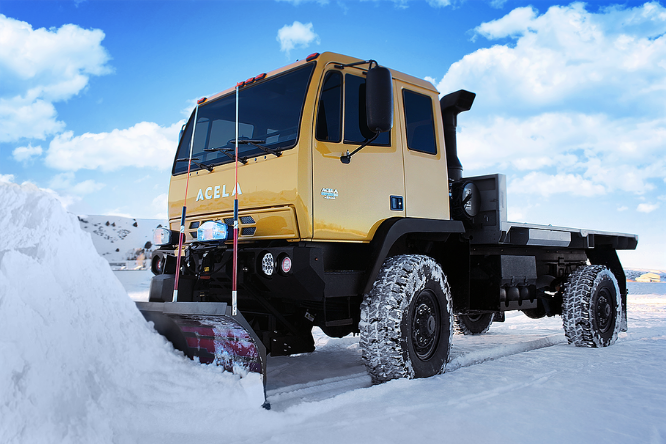 Whether you’re plowing mountain passes or sub-division roadways, Acela Truck Company, manufacturer of North America’s most capable trucks, now offers purpose-built Euro-style cab over snow and ice removal trucks in 4x4 and 6x6 variations of its Monterra:tm: line of truck chassis. With 47-inch M&S military tires, 23-inches of ground clearance, full-time all-wheel drive, cab over visibility, 54-foot turning radius, multiple plow and de-ice solutions, there is no other modern truck platform that can compete when it comes to performing in the extremes of virtually any snow and ice management application. Acela Monterra’s are routinely tested in some of the most demanding conditions and terrains throughout the Norther Rocky Mountains and routinely outperform any other comparable truck platform.